The SQL Server service account requires access to the database files, and when using Windows authentication, the currently logged in user also requires full administrative access to the database files. 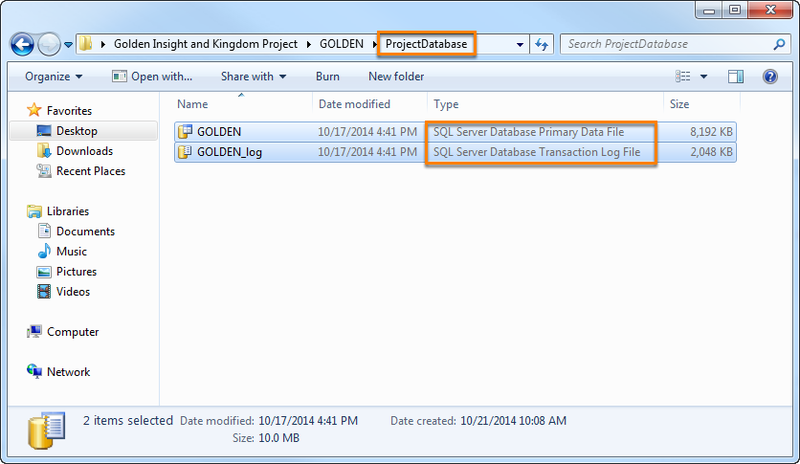 You must have full permission for both the project directory and database files to successfully connect to the Kingdom database via SQL Server. NOTE: Changing permissions on files and folders can be confusing and potentially harmful to the privacy of your work if done incorrectly. As such, we strongly recommend that you consult your IT department before configuring or changing the permissions on any files and folders. If you receive this error when trying to connect to your Kingdom database via SQL Server, it is likely that you do not have sufficient permission to access and write the database files (.mdf and .ldf files). Note: The SQL Server service is also unable to see any mapped network drives you have set up (the mappings are on a per-user basis). Make sure your Kingdom project is located in a local drive. First of all, make sure you are the administrator of your machine, or given administrative privileges to edit file system permissions. Navigate to your Kingdom project directory and open the ProjectDatabase folder. 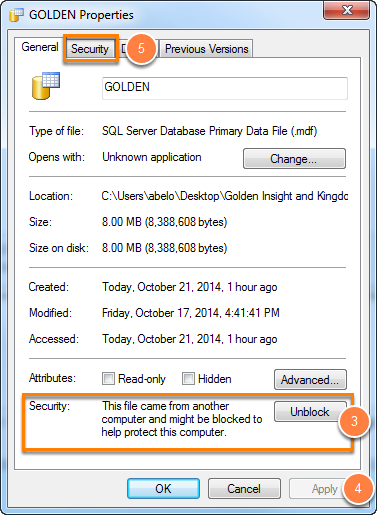 The files inside are your database files — .mdf (primary data) and .ldf (transaction log) files. Right click on the files and select Properties. In the Properties window, if you see the Security message at the bottom (see image above), click Unblock. To change permissions, click Edit. 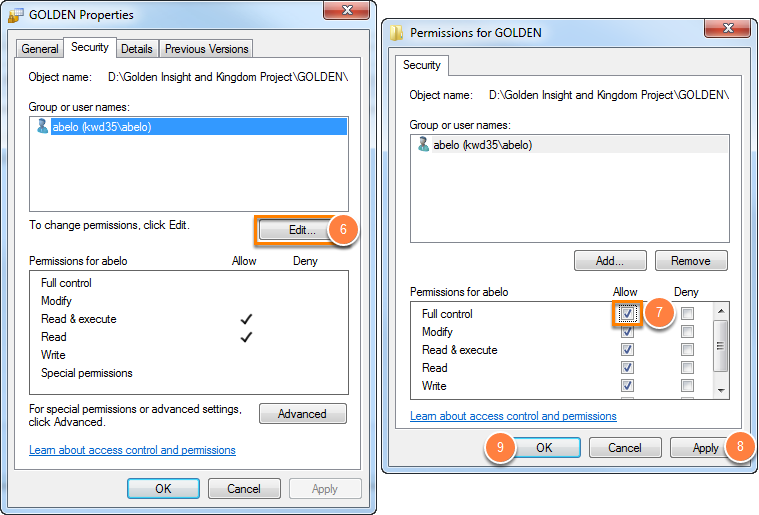 The Permissions window will be displayed. 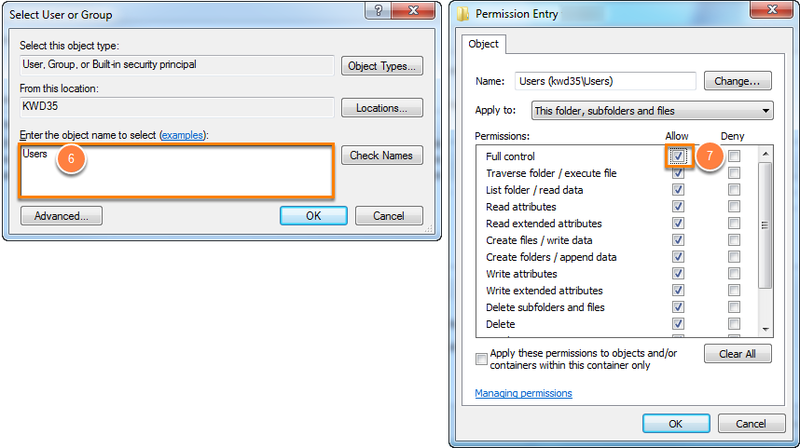 In the Permissions window, select the Full control check box. Return to the Links tab in Insight and click Connect to try again. If you attempt to attach a database that is in a directory where the permissions are inherited from a restricted parent, you will get the same "Access is denied" error. Follow the instructions below to change the permission of the project directory. Right click on the project directory and select Properties. Open the Security tab. 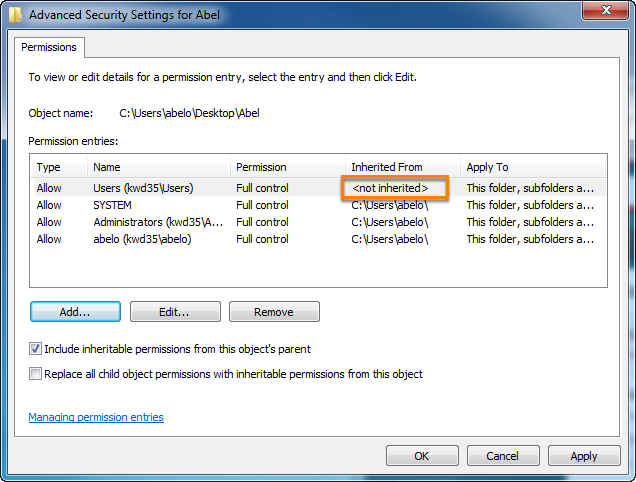 Notice that you cannot Edit the permissions for the groups/users because they are inherited from their parent objects. Click Advanced for special permissions and advanced settings. In the Advanced Security Settings window, select Change Permissions. Click Add to insert a new user that is free from the inherited permissions. Type Users as the object name and click OK. In the Permission Entry window, select the Full control check box and click OK. In the Advanced Security Settings window, click Apply and click OK.